This view from Kawainui Marsh, next to Kalaheo High School, shows the Kawainui Channel with a jogging path along it. Kailua is shown on the left. This picture is combined from two photos. A planned $5.5 million project to benefit endangered Hawaiian waterbirds at Kailua's Kawainui Marsh is in jeopardy because state and city officials disagree on who should be responsible for flood-control measures there. Losers if the plan is canceled will be the native Hawaiian coots, stilts, moorhens and ducks that would benefit from 40 acres of shallow water ponds proposed for a portion of the 450-acre marsh. The marsh is overgrown with non-native plants that aren't the best habitat for the native birds. The state Department of Land and Natural Resources wants to restore wetland conditions for the birds and will put up the 25 percent matching funds to attract 75 percent federal funds. But the U.S. Army Corps of Engineers, which has designed the project for the state, can't get funding from Congress to do it until one government entity, either the state or the city, has control of the project's land. A portion of the land needed for the ponds project is owned by the city, while another portion is state-owned. City officials want the state to take over flood control maintenance in the marsh if the state receives use of city land. State officials want the city to keep doing flood control maintenance, while the state improves conditions for wildlife. U.S. Sen. Daniel Inouye worked to get a token $10,000 appropriated to the U.S. Army Corps of Engineers in the federal budget to keep the ponds project alive. "I am hopeful that a compromise will be reached between the government entities whereby each would share in the maintenance responsibilities," Inouye said. City and state views of the situation have been at odds for a decade. DLNR Director Peter Young and Mayor Mufi Hannemann have been involved in recent negotiations to resolve the issue. 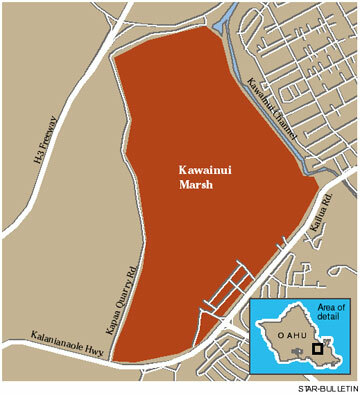 But recent letters from Young and Hannemann to the coalition of environmental, community and Hawaiian clubs that support marsh improvements show that the city and state positions are still far apart. "We would like to get resolution," Young said yesterday. "This has been going on for too long." "Traditionally, as well as legally through statute, counties have flood-control responsibilities," he said. Hannemann couldn't be reached for comment yesterday. But he wrote in an Oct. 21 letter that "it is the state that is holding up the transfer" by not taking over flood-control maintenance. "Congress is starting to crack down on projects without local support," Inouye's spokes-woman, Jennifer Sabas, said of its refusal to put $700,000 into the project this year as had been planned. "It's a pretty serious message." Muriel Seto, who has been an advocate for Kawainui Marsh for decades, called on city and state officials to resolve their differences. "If we do blow it this time, it will be a blot to both levels of government," she said.